Can I use the app without a Telstra ID? 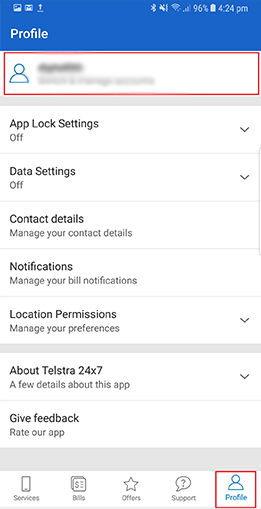 If you install the app on a device that’s connected to the Telstra mobile network, you can use the app without having to login using your Telstra ID. But if you don’t log in with your Telstra ID, it limits what you can do with the app. And for security reasons, you won’t be able to use the app at all when you’re connected to Wi-Fi if you are not logged in with your Telstra ID. So in short, it’s best to log in using your Telstra ID. Enter your Telstra ID login details then tap ‘Log in with Telstra ID’. If you don’t have a Telstra ID, you can tap ‘Register’. If you’ve forgotten you username and password, tap ‘Forgotten username/password’ and follow the prompts. If you've successfully logged in, you’ll see the menu display. Used the App, but not sure if you logged in? If you have already used your Telstra ID on the app, check that you are logged in. If you’re not, tap on ‘log in’ next to your existing Telstra ID username. Once logged in, you’ll have access to all the functions of the app. If you haven’t yet logged into your app using your Telstra ID, then tap ‘Log in with your Telstra ID’. If you haven’t yet signed up for a Telstra ID, tap the ‘Register’ button. 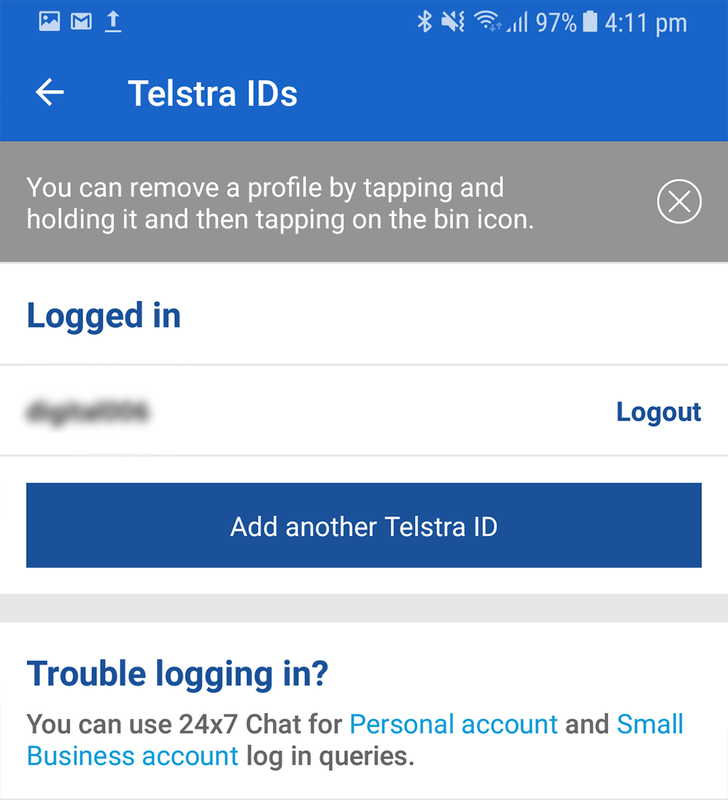 - You can store up to 3 accounts/Telstra IDs at once on the Telstra 24x7 App. Make sure that you have a working internet connection - open a browser and try to visit a website. If you haven’t yet logged in using your Telstra ID, make sure you’re connected to the Telstra mobile network - not a Wi-Fi network. To be sure, turn OFF any Wi-Fi. Make sure your username and password are correct. Use these links if you don’t know your username or password. There may be technical issues. If so, wait a few minutes then try again. You're a Telstra Business or Enterprise and Government customer. The Telstra 24x7 App for iPhone only supports personal and small business customers. Make sure you’re connected to the Telstra mobile network. If you’re connected but not logged into the App using your Telstra ID, you will be limited in what you can do in the app. There may be a high volume of users - wait a few minutes then try again. What if my service is not listed in my account? 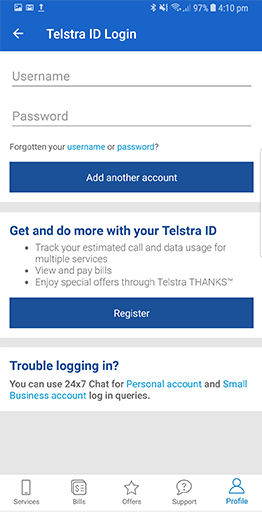 To add your Pre-Paid service to your Telstra 24x7 My Account so it’s displayed when you’re using the app, log in with your Telstra ID. Why can’t I recharge my pre-paid service? You only have three attempts at providing your PIN, then your stored card details will be deleted and you'll need to add it to your account again by recharging online. The recharge might also fail due to technical issues. If so, wait a few minutes then try again. Your account may be suspended due to multiple failed recharge attempts. 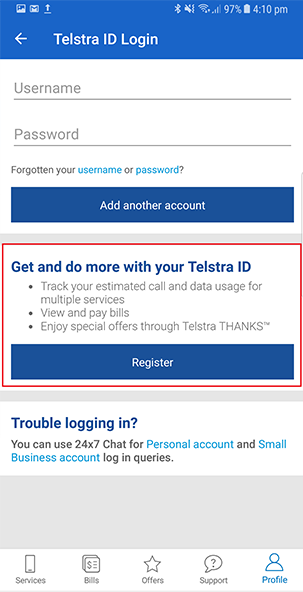 How do I request a payment extension in the Telstra 24x7 App? How do I view or print my bill in the Telstra 24x7®App?